← Need to capture a print job. How to capture a print job from Windows Print Spooler system? 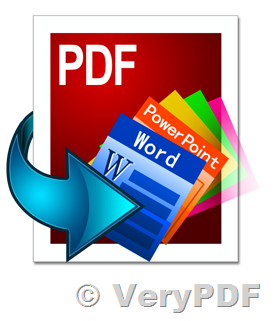 VeryPDF PDF Converter Master is also named PDF to Any Converter software, it converts PDF to 16 output formats, including Office (Word, Excel, PowerPoint), iWork, EPUB, images and more! So you can view or edit files in your preferred format. VeryPDF PDF Converter Master for iOS is the only PDF Converter app that lets you convert PDF files to Office, iWork and other document formats right on your iPhone, iPad, without the Internet connection. 8 output formats including Office, iWork and more. Accurate, preserve everything as the original PDF. Support iCloud drive and other cloud services. 100% secured, convert PDF locally. Convert PDF to Word, Excel, Pages, Numbers and more on your iPhone, iPad. Convert your PDF files into iWork, Office and more quickly and accurately anywhere, anytime. Work more effectively with PDF Converter Master iOS version. This is the only app that you can find which lets you convert PDF to Office and iWork locally on your iOS devices. When we got a PDF file on our iPhone, iPad, you can quickly convert it to Pages, Word or other document formats for easier editing. So you can reuse, edit PDF content in Pages, Word apps directly on your iPhone or iPad. Once installed, PDF Converter Master will appear in "Open in…" list on your iOS device, so you can add PDF files quickly. If you have set up the iCloud, dropbox, box or Google Drive app, you can also open files from the cloud services. It takes only 3 steps to convert a PDF file to the file format you need. After conversion, you can open the output file directly, share via email or save in cloud. You can open PDF files received from email, open PDFs from any other apps with PDF Converter Master, open and convert PDF files from iCloud, Dropbox, import files to your iPhone, iPad via iTunes. So you can convert PDF files easily right on your iPhone, iPad. 8 output formats meet all your conversion needs, including Office (docx, xlsx, pptx), iWork (pages, numbers, key), rtf, and txt. So you can easily make change or reuse PDF content. Accuracy is the key for PDF conversion. PDF and other document formats are totally different, thanks to the advance algorithm, it can keep the original formatting and content well in Office and iWork, so you don’t need to spend extra time to modify the content and formatting. It can handle the most complex document. PDF Converter Master convert PDF files 100% locally on your iOS device. Unlike other converters which send your document online and let you download the output file. So the confidentiality of your data is safe. Convert large PDF files in a few seconds, and no file size limitations. Requires iOS 7.0 or later. Compatible with iPhone, iPad, and iPod touch. This app is optimized for iPhone 6 & 6 Plus. Localized into following languages: English, French, German, Italian, Portuguese, Spanish, Simplified Chinese, Traditional Chinese. How to convert PDF to word, PDF to PowerPoint without losing image resolution? How to convert PDF to word or Excel automatically by OCR to Any Converter? This entry was posted in PDF to Any Converter and tagged PDF to Any, pdf to epub, PDF to Excel, PDF to image, pdf to iwork, pdf to office, PDF to PowerPoint, PDF to Word. Bookmark the permalink.